Help keep your party plans stress free. Make these appetizers ahead of time and slice right before serving. Serve with a dollop of salsa or serve salsa in a small bowl for dipping. 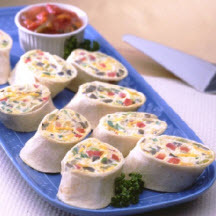 Or, simply serve them as meatless sandwich wraps for lunch or a light supper. Combine green chiles, cream cheese, cheddar cheese, Monterey Jack cheeses, green onions, olives, red pepper and hot pepper sauce in medium bowl. Spread 1/2 cup cheese mixture over each tortilla. Roll up. Wrap in plastic wrap; refrigerate for 30 minutes. Cut each tortilla roll into 1/2-inch slices. Serve with salsa. Makes 4 main servings or 48 appetizers.